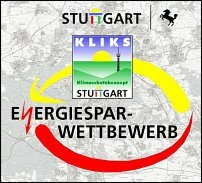 In the years 2002 to 2004, the state capital Stuttgart has implemented an energy saving competition. Despite great gains resonance in the population was not large, so that was dispensed to a subsequent repetition of the competition until today. The awards ceremony for the winners of the Energy Saving Competition took place in Stuttgart’s city hall on 23 November 2004.